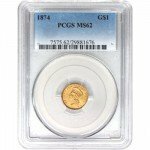 Customers; Please note that these coins will be certified by the PCGS OR NGC to be in MS63 condition. 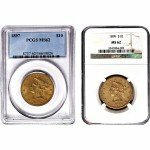 Coins will be from years of our choice, all of which will range from 1849 to 1854. The $1 Gold Coin was produced by the United States Mint from 1849-1889. 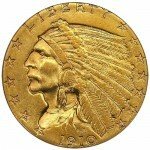 During this 40 year mintage period, the Gold Dollar coin would undergo several revisions, consequently resulting in three different versions: the original (type 1), the 1854 version (type 2) and the 1856 revision (type 3). This particular $1 Liberty Gold Dollar Coin is one of the original type 1 versions that were in circulation between 1849 and 1854. 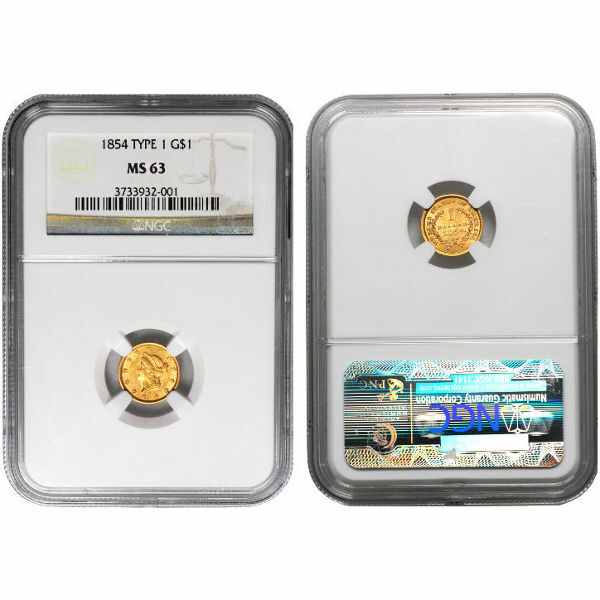 Each of the coins included in this collection have been minted with .048375 troy oz of gold and certified with an MS63 grade by either the NGC (Numismatic Guaranty Corporation) or the PCGS (Professional Coin Grading Service). Coins with a grade of MS63 appear in acceptable condition with only a minor amount of contact marks, which is quite remarkable considering they are over 100 years old. 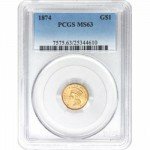 All coins have been kept sealed in their individual NGC or PCGS slab. As the first version of the $1 Liberty Gold Dollar, the coin displays the original artwork of James B. Longacre. This design, which was known as the “Coronet,” is reminiscent of ancient greco-roman currency. It depicts a portrait of Lady Liberty in profile wearing the eponymous crown in her hair. Encircling her profile is a border of thirteen stars with each one honoring one of the original colonies. On the reverse side of the coin, Longacre uses an open wreath as the primary focal point in his design. This wreath pays tribute to the US’s agricultural industry and hardworking farmers who have made it so successful. Printed in the center of the wreath is the coin’s denomination and mintage date. Also inscribed along the edge of the coin is our country’s name. As the original design for the Liberty gold dollar coin, this type I coin is certain to add both historical and financial value to any collection or investment portfolio. Because of its limited availability, be sure to order your coin while supplies are still available. If you would like to learn more about this particular coin, please call us at 888-989-7223. We can also assist you through live chat or email.